Some days ago, I started to work on « modular » tracks. 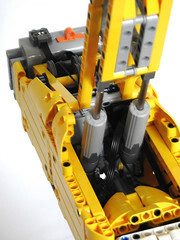 Modular = has its own motor and so can be installed on any type of machine. The challenge was a success as I’ve finally been able to produce two track with an integrated PF-M motor installed and multiple assembly option. The full album is available on FlickR. After that, a support was needed. 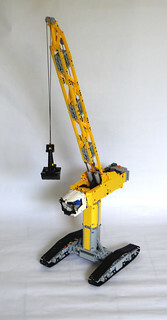 It’s been a while since I wanted to make a cable crane. But I still not have enough cable for all the function, so let integrate some Power function in it. What was achieved looks like harbor crane used to offload bulk material from cargo ships. 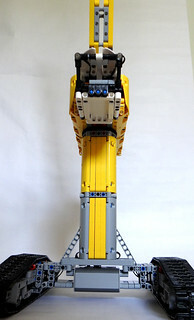 The main mast is raised/down through two linear actuators powered by a PF-L.
One (long) cable is used to connect the clamshell to two winches, each one powered by a PF-L. 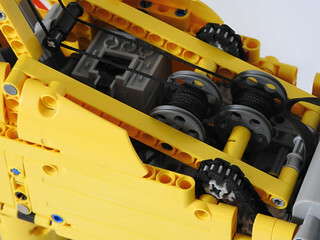 When the winches turn in the same direction the clamshell goes up or down, when they turn in oppositte direction the clamshell open or close. Easy. 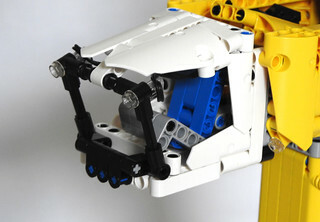 The MOC is in two independent parts. The upper part is the cabin, the superstructure and the mast, and has its own battery and SBrick controller. 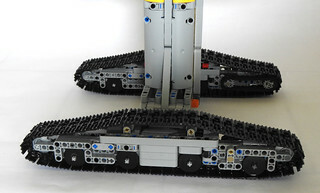 The lower part is composed of the two tracks, the supporting mast and the turntable powered by a PF-XL motor. 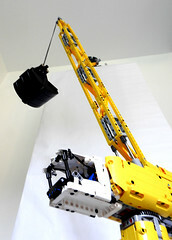 The lower part has also its own battery (installed the lowest possible to stabilize the crane) and its own SBrick controller.